I never read the book but i loved the movie, heres my TT. I haven't read this book but great teaser! Priya-I'm following you (cluedn) since we both like to participate in TT! @Aimee - I loved your teaser as well! Thanks! My roommate keeps telling me I have to read this. I hope you're enjoying it! Great teaser! I have yet to read Coraline but Neil Gaiman is a fantastic author =) Thanks for dropping by! Excellent teaser. 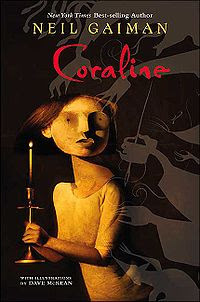 Though I have heard of Coraline, I have not read or seen it. Thanks for visiting! Oooh I have not read this book yet, seen the movie but I MUST read it!!! @Pamela - Loved your teaser; going to try to get my hands on that book!! @Li - I just started reading Neil Gaiman and I am totally loving him! @Me, My Shelf And I - You really must!! And I must see the movie! Thanks for stopping by Sinnful Books! I love, love, love Coraline! I read it several years ago, and it has stuck with me ever since! Have you seen the movie? Freaky, but it doesn't really begin to touch the book!!! Armstrong is an awesome author! Frostbitten -- the book I'm reading -- is farther into the series, so start with Bitten (I think). If you like werewolves, this is a good series!! @BREE- Thanks :) I liked your teaser as well! @Heather- The movie is pretty recent, right? @Sinn- Oh, thanks for telling that! I haven't read many werewolf-related books as of now, but I'm sure I'll love it! !